Solution Saddles Customer Stories: Originally sceptical of the treeless saddle concept, Rachel now refuses to put a treed saddle on her ex racehorse’s back since discovering the revolutionary SMART saddle range. Originally sceptical of the treeless saddle concept, Rachel now refuses to put a treed saddle on her ex racehorse’s back since discovering the revolutionary SMART saddle range. "I recently purchased a SMART Pro Dressage saddle for my ex-racehorse who has been diagnosed with kissing spines. 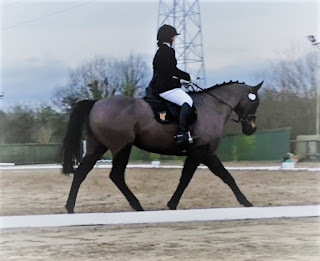 He struggled to swing through his back properly, which was often being picked up in affiliated dressage tests; believing this to be his back, I never thought I would improve it. Before discovering the SMART saddle range, I was very sceptical of treeless saddles and believed they created pressure points. That was until a friend recommended Solution Saddles’ SMART saddle range and I thought “what have I got to lose?”. It was the best decision I have ever made! My horse just loves it; he swings through his back and is happier to step under more with his hind legs. At first, it took me a couple of weeks to get used to the different feel and not block my horse from moving forwards. However, since buying the saddle, we have had some positive comments from BD judges and are now extremely hopeful that we will move up a level this year. My horse’s physiotherapist also could not believe how good his back was; he showed no pain at all, which has been unheard of over the past two years. SMART saddles are truly revolutionary, they have changed my mind and my horse’s way of going completely - I would never use anything else on my horses. I would now like a SMART PRO Jump saddle for myself and a SMART Native for my daughter’s 11.2hh pony. I refuse to put a saddle with a tree back on my own horse, so no jumping for us for a while. SMART Saddles are just the best and I would recommend them to anyone. A massive ‘Thank You’ for developing such brilliant saddles!"